Albert Henry Donnelly was born in Macksville 18th July 1916 (died 29th Dec 1989) and was one of 15 children. His father was a teamster and worked in the timber industry. Albert was a timber man by trade and worked with his brother Wes logging. Albert left school when he was 13 to go log falling with an axe and owned a bullock team to pull his logs out when he was 15. He lived at Warrell Creek which later became Donnellyville. Albert was busy making a living so didn’t start chopping competitively until he was in his early 30’s and he retired from woodchopping in 1976 at the age of 60. Earliest ribbon found was a first at Dorrigo Bushman’s Carnival 1945. Albert wasn’t a very tall man but was very strong and excelled in the standing block and combination events. Albert was placed 4th in the 14” SB World Championship at Coffs Harbour on the 11-4-1964. Albert didn’t travel to the Royal Shows very often as he felt he couldn’t afford to be away from work that long. 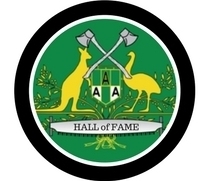 Albert won many championships within the North Coast and it surrounds. At Gosford Albert won both the 13” Underhand and 13” Standing Block championships each worth 100 pound in 1958. 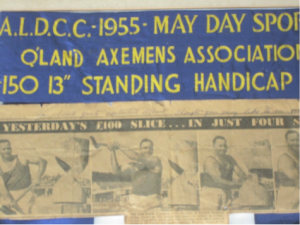 One of Alberts biggest financial wins was in 1955 when he won the ALDCC May Day Sports Day Queensland Axemen’s Association 150 Pound 13” Standing block. This was several months’ pay to Albert. In 1956 at Taree, Albert won the 13” Standing Block Championship beating Jim Lavis a champion axemen of this time, and Jim when asked by Les Slee why did he let Donnelly beat him, Jim reportedly replied “ he would have beat you as well if you had been there”. Albert also competed annually the North Coast National Exhibition at Lismore competing regularly in the Interstate Relay NSW vs QLD and captaining the team on many occasions. He also loved taking the family to Brunswick Heads regularly to compete. 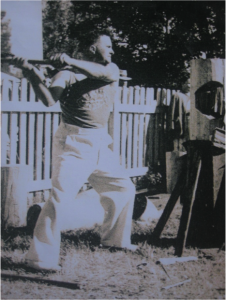 Albert was a valued member of the North Coast Axemen’s Association throughout his woodchopping career. He and his brother Wes supplied woodchop blocks for the Macksville and surrounding shows for over 30 years.